This development could become the foundation for creating new-generation medicines capable of curing mankind of genetic illnesses. A group of scientists at the Institute of Chemical Biology and Fundamental Medicine in Novosibirsk has identified and synthesized a previously unknown class of chemical nucleic acid analogues called phosphoryl guanidines. Based on this discovery it will be possible to create medicine capable of curing mankind of genetic diseases, as well as viruses and infections. The world scientific community has already synthesized analogues to DNA and RNA. Currently, five analogues to nucleic acid exist. The scientists from Novosibirsk affirm that they have discovered a sixth. "We have identified new analogues to DNA and RNA," says Maxim Kupryushkin, one of the project's authors and a collaborator at the Institute of Chemical Biology and Fundamental Medicine at the Russian Academy of Sciences. "Moreover, we discovered not only single compounds, as in the first five cases, but an entire class." The scientists receive artificial fragments of nucleic acid on their DNA synthesizer, which is a mirrored reflection of an undesirable or damaged gene region that needs to be manipulated. "In this way it is possible ‘to turn off’ or correct the gene structure of a person or microorganism," said Kupryushkin. In Kupryushkin's words, the new substances have an increased capacity to penetrate an organism's live cells. At the same time they are resistant to the enzymes’ destructive activity and are capable of forming a strong double spiral with DNA and RNA. If the scientists from Novosibirsk are able to put their research to practical use, it would have significant potential in the fields of biotechnology and pharmaceuticals. "The most ambitious trend in this field is the development of gene-oriented medicine on the basis of DNA analogues," explains Kupryushkin. "However, there are also other prospects, such as the creation of testing systems for detecting all possible diseases." According to Kupryushkin, the mechanism of the synthetic analogue affecting the genome is universal for curing any illness. "This technology can help create medicine and cure genetic, viral and bacterial illnesses,” Kupryushkin said. “In particular, it could help with Duchenne muscular dystrophy, tuberculosis or cancer." Another asset of the technology is that the cure can be found without using antibiotics, which often have damaging collateral effects. The scientists have founded a company called NooGen based at their institute to help commercialize their research. They have also applied for an international patent, which would cover their findings as a means of procuring this new DNA class, as well as the phosphoryl guanidines class itself. "In this phase our objective is to ‘get a feel’ for the most promising directions," said Kupryushkin. "For this we need biological partners with whom we will conduct further research to test the medicines for toxicity, effectiveness and their breakdown in the body." Currently, the researchers are discussing collaboration with laboratories throughout the world. "In Russia, for example, we are speaking with various scientific research institutes, while abroad we have met with scientists from Oxford, Cambridge and other major world scientific centers." After obtaining the patent the scientists are planning to create their own laboratory for producing chemical compounds for research centers and pharmaceutical companies. "In order to organize the full-fledged production of DNA analogues we need about $1-2 million," says Kupryushkin. "This is why we are looking for commercial partners and investors." The world market for genetically oriented medicine is only now taking shape. For example, the American company Isis Pharmaceuticals develops drugs based on synthesized DNA analogues. 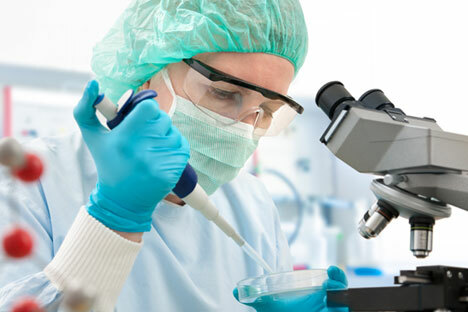 But the scientists from Novosibirsk believe all participants in this field will be able to find their niche in the creation of genetically oriented medicine. “There are endless illness targets in the world," concludes Kupryushkin.